Photovoltaic panels are easily one of the most recognizable green home features available on the market today. Unlike solar hot water panels or passive home heating, photovoltaic panels convert solar radiation directly into electricity, which can then be used to power your appliances, your electric car, and your geothermal heat pump. While battery storage used to be the de-facto method of electricity storage, grid tied systems are now rising in popularity because of the cost to purchase and maintain a battery system large enough to service the electricity needs of your home. With a grid-tied system, you can either reduce your power bills to zero, or, in some cases, your local utility board will even pay you for the excess power you generate. 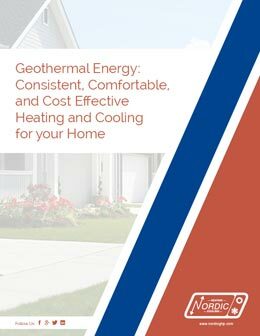 Geothermal heat pumps are a natural companion to photovoltaic panels, because they are so efficient. Unlike electric baseboard heat, which could also be powered by photovoltaic panels, geothermal heat pumps don’t generate heat. Instead, they simply move it from the warm earth into your home. Because of this, for every one watt of photovoltaic electricity put into a heat pump, you get 4 watts of usable heat energy pumped into your home. With electric baseboards, 1 watt of photovoltaic electricity results in 1 watt of heat energy. By pairing photovoltaic panels with geothermal heat pumps, you could reduce the required size of your array by up to 75%, that’s a great way to save money.